Follow the Georgia Coast, a 100+ mile stretch of land home to the Timucuan and Creek Indians as early as the 1500s. The English and Spanish fought over this young colony centuries later, and immigrants settled here for cotton, indigo, rice, fishing, and shipbuilding. In the 19th and 20th centuries, titans Henry Ford, Rockefeller, Reynolds, the Carnegies and others left their mark here. Follow in the footsteps of these iconic leaders and experience their authentic places of inspiration and invention. Day One Morning: Step back in time to WWII at the National Museum of the Mighty Eighth Air Force in Pooler. Marvel at the B-17 or interactive displays before heading south to the port city of Savannah. Hop aboard Old Town Trolley or a ride on Old Savannah Tours for narrated tours of America’s largest National Historic Landmark district. Afternoon: Enjoy lunch at Bubba’s Bistro in Richmond Hill before embarking on a driving tour of the city Henry Ford built. View his barber chair and other mementos at the Richmond Hill Museum. Drive south and stop in the Midway Museum for a guided tour of the historic house, church and cemetery where stories abound! Evening: Explore historic waterfront Darien and dine on the local catch at Skippers Fish Camp. Stay in the award-winning Open Gates B&B or scenic Blue Heron Inn overlooking Sapelo Island, a designated site on the Gullah-Geechee National Heritage Corridor. Day Two Morning: Journey south to begin your exploration of Georgia’s Golden Isles – St. Simons Island, Sea Island, Little St. Simons, Jekyll Island and the port city of Brunswick. On St. Simons, seek out "tree spirits", the lighthouse, Christ Church and historic pier village. Afternoon: Cross the Sidney Lanier bridge to Jekyll Island and the Jekyll Club Hotel, located in the National Historic District. Have lunch and tour the property, birthplace of the Federal Reserve and other significant events. 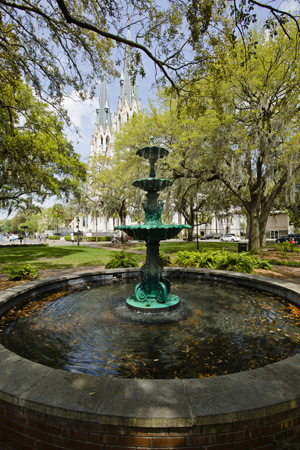 Travel to the historic coastal community of St. Marys, home to the Cumberland Island National Seashore Museum (first inhabited by American Indians) and gateway to this National Park. While in St. Marys, visit the Submarine Museum, historic Orange Hall House Museum, the Georgia Radio Museum & Hall of Fame. An overview of significant events – including the city’s role in the War of 1812 – is available at St. Marys History Walk. The Coast offers dozens of museums, historic sites, house museums and heritage attractions that tell the story of this region, past to present. Explore Coastal Georgia to learn about its people and the places shaped by settlement, industry, maritime exploration, military conflict and agriculture.